A worm moves by extending and compressing its body. Perhaps this affects the diameter of the nerves, and thus the speed of impulse conduction. Here we investigate. The real question: Is the nerve an antique telephone cord or a Chinese finger trap? Here you will learn, using cable theory, how stretching an axon can affect the time an impulse takes to travel along an axon. Introduction to Conduction Velocity - You will find this experiment helpful to get a general idea of conduction velocity and how it is measured. Note: In 2014, older, related experiments by our team were peer-reviewed and published by the American Physiological Society in the journal "Advances in Physiology Education" - Read the paper intrepid scientists! for a more formalized treatment of cable theory and worm anatomy. We return to the concept of conduction velocity. The earthworm is a soft animal with distinct segments (rings) that can compress and extend hydraulically, which the worm uses to crawl underground. Unlike we humans, the worm does not have rigid structures like bones with which to move muscles around on pivot points. Random fact: if you brush a worm carefully down its length with your finger, you may detect with your fingers, yet not see with your eyes, bristles going in one vs. another direction. These bristles allow a worm to grip the earth as it moves. When you watch the behavior of an earthworm as it moves in your backyard after a rainy night, you will notice a worm can change its entire body length up to 2x as it compresses and extends. Since the tissues inside the worm must stretch as well, how does such compression and extension affect the nerves? Specifically, how does it affect the speed of the impulses (action potentials) as they travel along axons inside the nerve? . Presumably, the earthworm nerves have mechanisms to be tolerant of compression and extension, and thus we can ask, even without doing a dissection: "What is the structure of such a nerve?" Let's do a thought experiment whereby we imagine the types of structures that could accommodate the elastic ability of the earthworm and how such structures would affect impulse conduction. 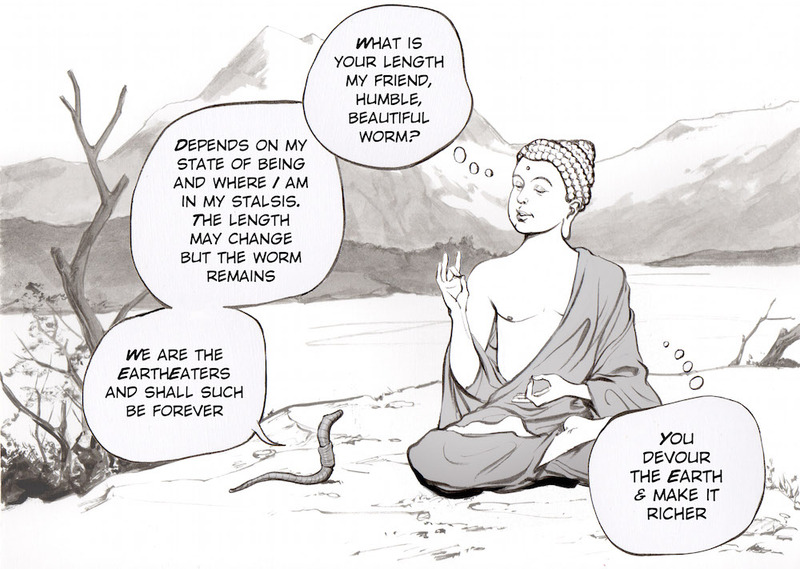 First, we need to think in "worm relativity," where length is a more a state of being than something fixed. Both concepts are important for understanding signal propagation from within the worm and without the worm. Given two concepts of length, we can imagine three scenarios of impulse propagation in a stretched vs. relaxed worm. 1) The Nerve is similar to an old-fashioned coiled Telephone Cord, which is a spiral structure that can extend and compress with ease. When two points along the coil (the worm) are stretched, the time for a signal to travel between the two points is the same, but the apparent length is greater. Prediction: Worm Segments per Second will remain the same. Meters per Second will increase. 2) The Nerve is like a Chinese Finger Trap, with a structure whose diameter decreases when extended. Recall from our previous experiments that the two important components of cable theory are the length constant and the time constant. If stretching the nerve results in smaller diameter, the internal axon resistance will increase (because when a cross-sectional area of wires decreases, the resistance per unit length increases). 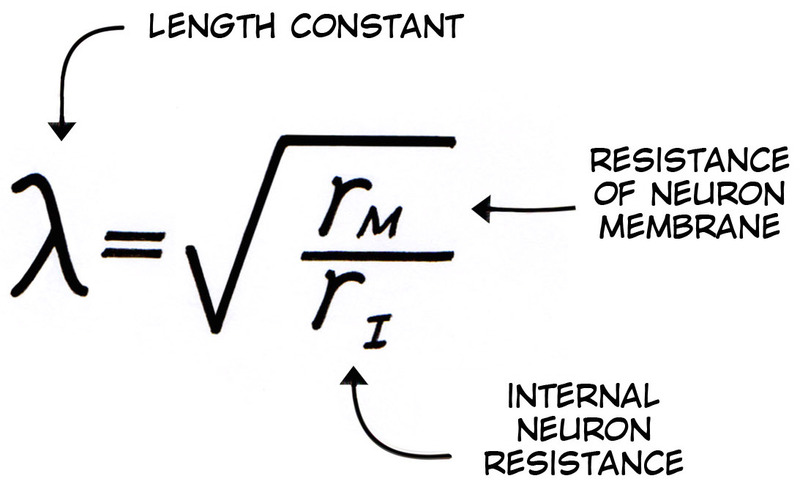 And....when the internal axon resistance increases, the length constant will decrease. A decrease in length constant will result in a longer time delay between two points along the nerve. Prediction: Worms Segments per Second will decrease. Meters per second could either increase, stay the same, or decrease, depending of magnitude of time delay change between segments. 3) The Nerve is highly wrinkled when compressed, and highly inflated when stretched. Though difficult to divine, such a structure could be feasible. In the inflated state, the nerve diameter is actually larger. Prediction: Worms Segments per Second will increase. Meters per Second will increase. Hypothesis 1: The nerve is like a telephone cord- Diameter will not change. Prediction: No change in Time Delay when worm is stretched. 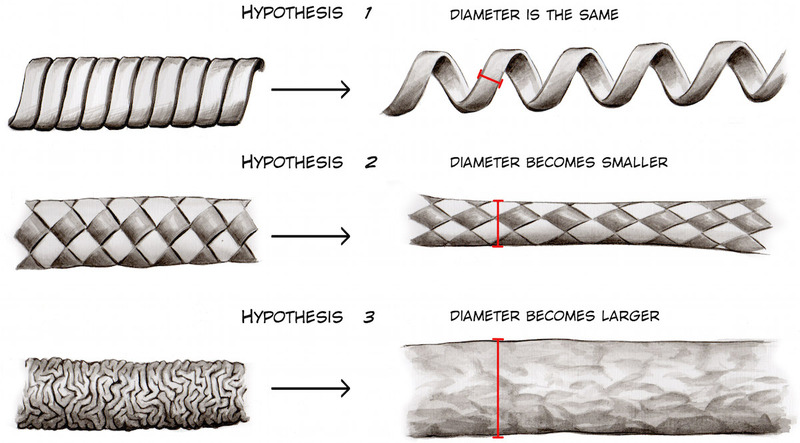 Hypothesis 2: The nerve is like a Chinese Finger Trap, Diameter will decrease. Prediction: Increase in Time Delay when worm is stretched. Hypothesis 3: The nerve goes from a wrinkled to highly inflated state. Diameter will increase. Prediction: Decrease in Time Delay when worm is stretched. Now we go to our lab and investigate!!! Modern laptops, over the past four years, have stopped having stereo audio inputs. We recommend the iMic to provide stereo audio input to your computer. Note: this procedure is very similar to our other conduction velocity experiments, as shown above in the video. Place an earthworm in 10% ethanol for ~3 minutes (until it is no longer moving). This can be done most easily done be mixing 50 ml vodka with 150 ml water. Place the Red Electrode (channel one) 2-3 cm away from mouth. 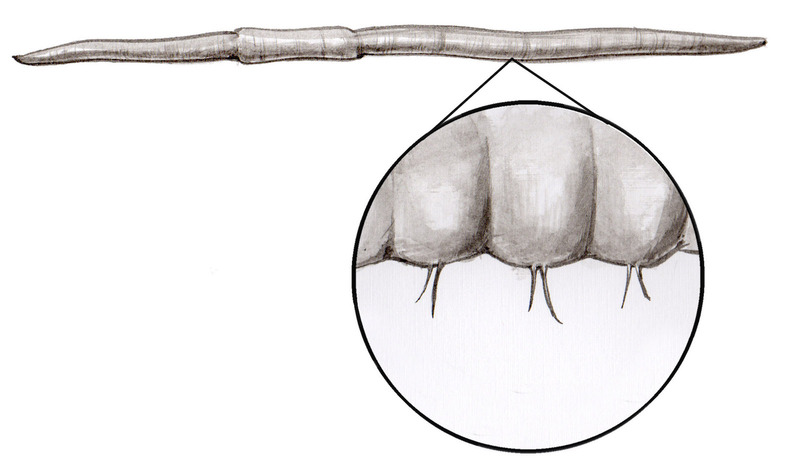 The mouth of the worm is the end closest to the fleshy "clitellum" in the worm. Place the White Electrode (channel two) 6-8 cm away from mouth. Place the Black Electrode (ground) some distance further away. Plug the electrodes into your 2-channel SpikerBox, the stereo audio out cable into your USB stereo audio adaptor (typically an iMic), and the USB end of the iMic into the USB port of your computer. Open our SpikeRecorder software, open preferences (the gear symbol), and enable your two iMic Audio channels. Also unmute the Speaker output in the preferences so you can hear the evoked spikes. Using your Digital Vernier Calipers, measure the distance between the Red and Black electrode pins. Turn the SpikerBox off to cause a blank space in the recording as a reference space. Now, harmlessly stretch the worm 1-2 cm, ensuring the electrodes are in the same relative location (same worm segments) in the worm. Turn the SpikerBox back on, and tap the worm in mouth end again with your glass or plastic probe in a similar fashion as before, about 3-4 times. Remove the electrodes from the worm, please the worm briefly in water to remoisterize it, and return the worm to its styrofoam container. It can tolerate the needle placement and be used for another experiment another day, or you can return it to the environment where you found if you live in wet climates where Earthworms can be harvested in your backyard. As shown in the video above (and in the intro, comparing nerve speed, and temperature experiments), measure the time delay between the two channels. Try doing it in multiple spikes in the same animal, and perhaps comparing the LGN vs. the MGN. Use the following table below as a guide. A length constant can be thought of as a measure of how loud the voice of the vigilants decreeing "open" is. If the "Open" is very loud, many vigilants can hear the open command at once, thus allowing many doors to open at the same time. This is equivalent to a high length constant. The time constant is a measure of how fast the "Open" command is said. If "Open" is said very slowly, there will be a delay in the transmission of the "open" command, no matter how loud it is uttered. This is equivalente to a high time constant. 2) While the video above only shows one measurement, we have repeated this experiment ~10 times, and we have always (yes, as scientists, we are saying "always") observed the time delay when stretching the worm. You can view some sample data (compressed excel file) here. "Confirming Jenkins and Carlson (12) and Carlson (7) it was found that the elapsed time for conduction between any two points increases as the animal is stretched. This is in accord with expectation from the fact that the diameter of the fiber must be decreasing as the length of the animal increases, since there is no great amount of coiling or sinuosity of the nerve cord or giant fibers at moderate extension. (There is however marked coiling or zigzagging of the neurofibrils which disappears as the specimen is stretched, so that the present data constitute evidence that conduction is not mediated directly by the neurofibrils.)" For a brief period we thought we had observed a new phenomenon, but we yield to you Professor Bullock, as we always shall. 5) While this experiment provides a useful model for how to change the internal neuron resistance (also called axon resistance) in an earthworm, and thus the length constant, we are still looking for a way to reversibly change the time constant in an animal preparation. 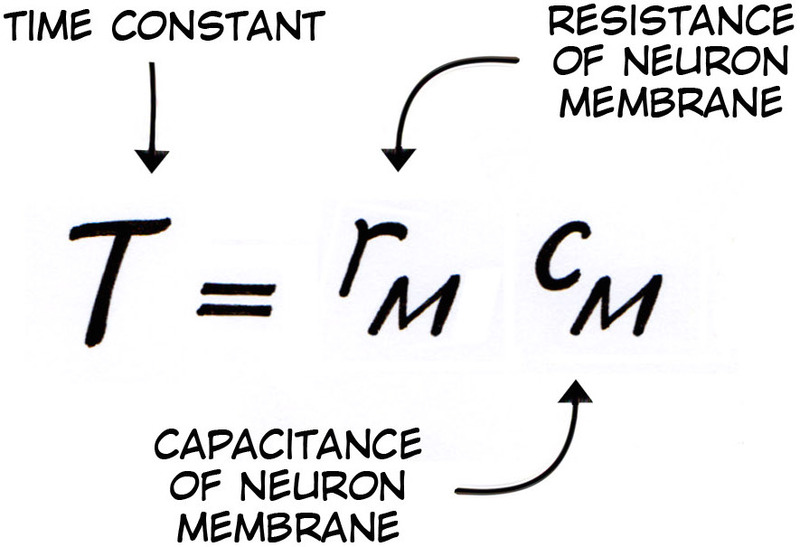 For example, we have read that since myelination increases the membrane resistance, it will make the length constant higher, but that since myelin also decreases the membrane capacitance, the increased membrane resistance and decreased membrane capacitance will "cancel out," leaving the time constant unaffected. Separating the oposite effects of increasing membrane resistance and decreasing membrane capacitance remains a challenge that we have not found well explained in the scientific literature, and we continue to search for the appropriate experimental preparation. 6) What could be the minimum change in length constant an animal can tolerate before you notice time delays in an animal. Is a buffer zone built-in to permit slight changes in length constant? It is worth a trip to the your university library to spend a couple hours browsing Theodore Bullock's tome, The Structure and Function of the Nervous System in Invertebrates and marvel on the scale of the unknown that exists in the world of the invertebrates. Thanks go to the Dunalastair Colegio, a high school in Santiago, Chile, where we first observed this effect during a teacher training workshop, and to Alejandra Riveros Campos, a Chilean Colleague who then helped with the systematic experiments verifying the time difference. What would happen if the nerve were cooled, as in a previous experiment, and then the stretched vs. unstretched time difference measured? We have left out the pesky detail that earthworm axons are actually myelinated and that saltatory conduction is occurring. How does this affect the interpretation of the results and our hypotheses? Note: Gracias to Italo Ahumada Morasky, a Chilean artist who illustrated this experiment with us.